The hedge viewing season is upon us. A real weakness for hedges plagues me. They arrest me when I am driving around. This is one of my favourite local ones. 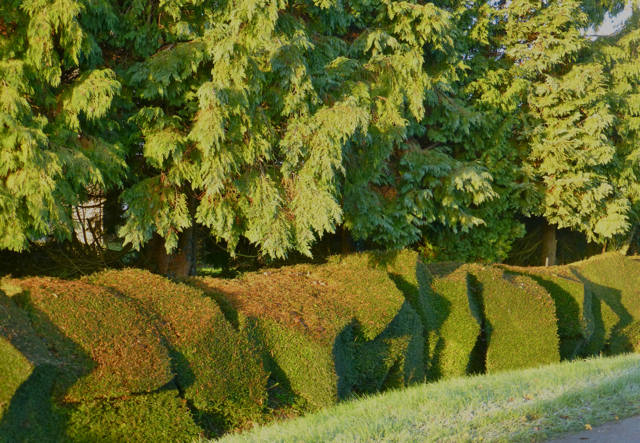 The three greens of hedge, grass and thuja and the Braque-effect shearing are perfect. You might think Lonicera pileata, commonly known as poor man’s box would be an uninspiring choice. Not so here where the sharp clip nips it into shape. What a super shape the hedge has been clipped into, it won’t matter if someone goes wrong! Like the sharp edged! I am also fond of hedges Catharine as are the garden birds. I have just inherited one in the back garden of our new home. Lawsons Cypress, I definitely wouldn’t have chosen this, however its the golden form and has been well controlled, I better keep it that way. Hehe, the hedge looks cool, but I am not a fan of such irregular shapes. I guess these forms fit very well for wall hedges, but I won’t make something like this in the centre of my garden. I prefer grass sculptures and hedges like these here. I am keen on hedges. Even last year I decided to create one in my parents garden. I had zero experience in that field but will a little bit help from professional gardener I have received good results. I was just thinking what kind of shape will fit for my front yard hedges. That one is different and I like different things. Thanks for the idea! Mine came from Stephen Read of Reads Nursery up at Bungay.